Are you ready to transform your closet into a calm, elegant part of your home? It’s all about organization – creating a peaceful, inviting space that offers a place for everything, ease of finding your favorite things, and an aesthetic where the color palette speaks to you. It’s time to cut through the visual noise. Whether you have a large dressing room or a small closet, here are 5 easy steps to get started on creating your personal haven. #1 First Things First- Declutter! 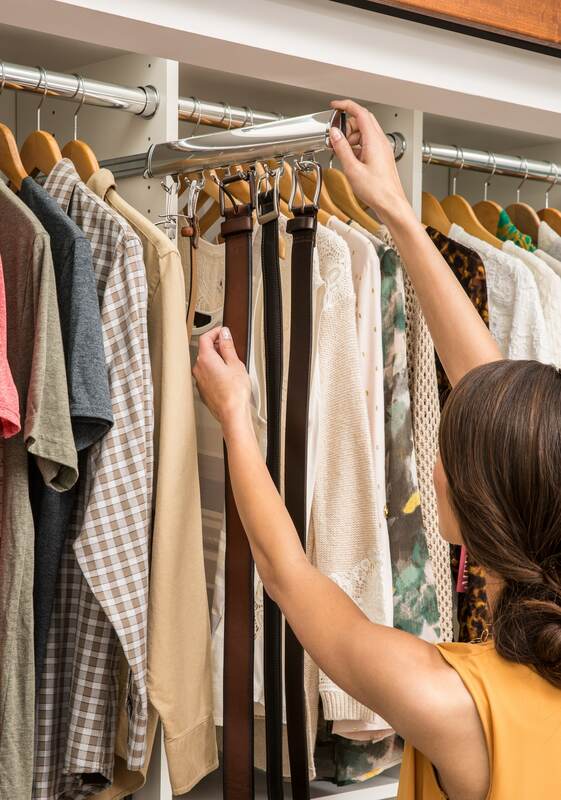 There are many closet cleaning philosophies- from the “one item in – one item out” rule, to Joshua Becker’s “12-12-12.” Or you can just do as your mother said and “clean your closet – now!” The way to help reduce clutter and maintain a clean, organized closet is to pick an organizing method that works best for you, and just do it. You’ll feel more calm the minute you haul out your first bag of discards and donations. #2 A Closet for Two, or is It All About You? Basic planning questions to ask are “who will use the space, and how much of the space does each person need?” Fair is fair, right? Will you share the hanging space and drawers, or will sharing stand in the way of the serenity you seek? This will lead you to dig deeper into specifics, such as “how much hanging and folded space is needed, what about shoe shelves, and how many drawers and baskets to include in the closet?” Since we all have our own organizing styles and needs, both parties can benefit from sharing in the closet design process – before moving on to selecting colors, styles and hardware. #3 Footwear Fanatic or Yoga Pant Diva? An important consideration as you plan your oasis beyond the closet doors is to assess your lifestyle and your storage needs. Do you love shoes or are you a purse collector? Consider open shelving to put them on display so you can admire your collection every day. Is your formal wear worn frequently or collecting dust? Take advantage of tall vertical space in the corners to maximize hanging storage. Are your favorite clothing items yoga pants, comfy jeans, and athletic wear? Place folded clothing on open shelves, in drawers, or in pull-out baskets to keep them organized and easy to access. Never enough time to get ready in the morning? Use a valet pole to hang your outfit the night before and save time getting dressed. A closet space with smart, functional storage can make it easy to find what you need and maintain a tidy, clutter-free environment. As you work on your closet improvement plan, be honest with yourself in thinking about your needs. #4 What is Your Vision of a Calm, Collected Space? Do you envision opening the closet doors where you revel in a rich color palette and in every thoughtful design detail with beauty and calm surrounding you? Or is it more about ease of wardrobe selection and dressing, having every item in its proper place, and low maintenance? Let your vision and your organizing needs be the driver throughout your closet planning process. 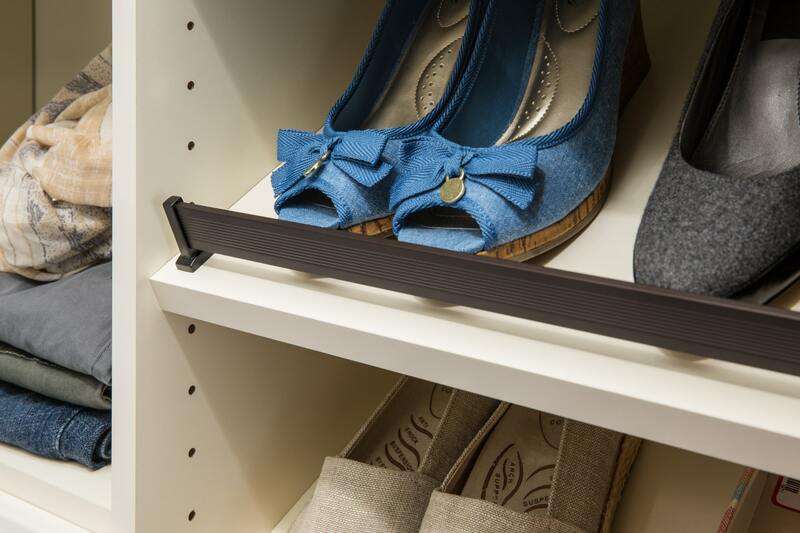 When planning your closet space, consider colors, style and hardware that will evoke a sense of calm, and look for features and accessories that add style and efficiency. Just some of the many options available include drawers to tuck away your belongings, double hanging shelves that maximize storage space, movable shelving for organizing shoes, purses, and folded items, a hamper to keep laundry at bay, as well as pull-out racks to keep pants, belts, ties and scarves in order. If you want to start remodeling your closet right away, EasyClosets simple online design tool and fast, free shipping means you can have a new DIY custom closet system in a matter of days. You can also choose to work with a professional closet designer, who can help you save time designing your closet while providing expert tips and ideas to make the most of your space.